During April 2003 a salvage excavation was conducted on the access road to the settlement of Segev Shalom (Permit No. A-3884*; map ref. NIG 18475–95/56875–95; OIG 13475–95/06875–95), in the wake of paving the road. The excavation, on behalf of the Antiquities Authority and financed by the Department of Public Works, was directed by V. Nikolsky-Carmel, with the assistance of V. Essman and V. Pirsky (surveying and drafting ), T. Sagiv (photography) and N. Ze’evi (pottery drawing). Remains of two walls (W11, W12; Fig. 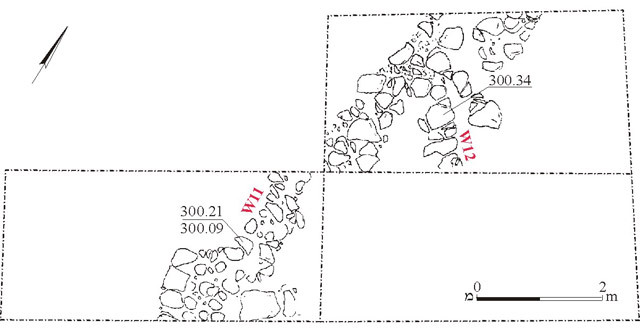 1), built of wadi pebbles mixed with limestone, were discovered in two half squares (25 sq m). The walls were probably part of a building whose floor was not preserved and only the foundations of the walls survived. The finds from the Late Byzantine period included a few pottery fragments of bowls (Fig. 2:1–3), a cooking pot (Fig. 2:4), a cooking pot lid (Fig. 2:5), a Gaza jar (Fig. 2:6), a bag-shaped store jar (Fig. 2:7) and jugs (Fig. 2:8, 9). The scant artifacts and the poorly preserved remains preclude identifying the building or its use.